Cozy up with a comfy blanket, under the stars on this Amish Poly Plain Back Glider. 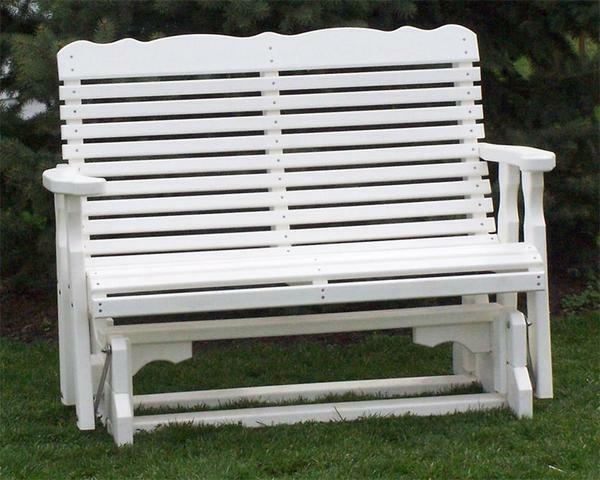 Made in America from recycled plastics, you'll be proud to own this truly eco-friendly poly lumber glider. Our skilled Amish Craftsman take extra time to ensure superior quality and durability so you can enjoy stress free evenings rocking back and fourth on your glider. With 14 different color options, you'll be sure to find the perfect glider for your porch. Take in the morning sunrise and enjoy your cup of coffee on your Amish Poly Plain Back Glider.